The global sales performance management (SPM) market is anticipated to grow at a decent pace in the upcoming years. The market is likely to develop because of the tools that have emerged as improved options for energy enterprise applications for example enterprise resource planning (ERP) and customer relationship management (CRM). Several organizations are realizing the future scope of opportunities in the sales performance management sector, and owing to this, various new firms are setting their foot gradually in the market. With the presence of handful of players, the market seems to be consolidated to an extent. Some of the key players dominating the global Oracle Corporation, IBM Corporation, Microsoft Corporation, Altify, Accent Technologies, Inc., Entomo, Inc., Xactly Corporation, Anaplan, Inc., Callidus Software Inc., Silvon Software Inc., Hybris AG, and The Aberdeen Group. 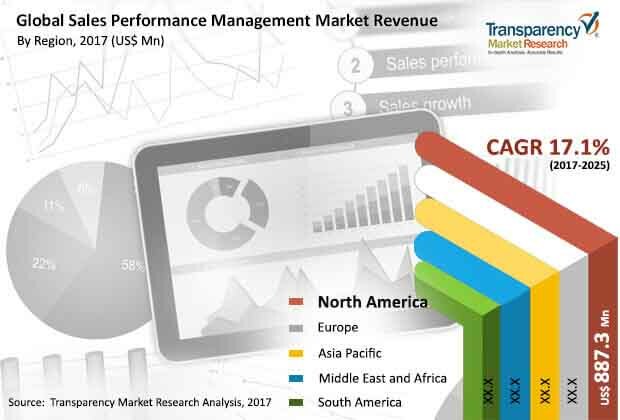 According to a report by Transparency Market Research (TMR), the global sales performance management (SPM) market is prognosticated to flourish with a robust CAGR of 17.1% within the forecast period from 2017 to 2025. In 2017, the SPM market was evaluated at around worth of US$2,296.0 mn. This figure is likely to soar around US$8,138.1 mn by the end of 2025, looking at the lucrative opportunities in coming years. On the basis of solution type, the sales performance market is dominated by sales planning solutions and sales forecasting segments. Geographically, North America was anticipated to be the most lucrative region for the key players leading the global sales performance management market, with a worth of around US$887.3 mn, trailed by Europe. This is due to increased rate of adoption of SPM among the end users for example BFSI and telecom and IT one of the main factor behind the growth of these region, with heavy demand for SPM technology. Rise in demand for organizations to have motivating incentive compensation management framework, rise in trend of bring-your-own-device (BYOD) in the companies, manifestation of channel effectiveness and process expertise, and rising demand to augment the value of company’s information are among the major factors driving the global sales performance management market. Along with that, rise in adoption of metric driven sales instruments, rise of innovations that combine business knowledge with cloud, and combining of integrated vendor offerings are anticipated to affect the global SPM market positively. On the flipside, the absence of awareness with respect to the advantages, doubtfulness in regards to sales data security, requirement for high initial investment, and continuous basic changes among associations is discouraging the sales performance management market from achieving its actual potential. Rising demand to augment the value of company’s information are among the major factors driving the global sales performance management market. Rise in adoption of metric driven sales instruments, and combining of integrated vendor offerings are anticipated to affect the global SPM market positively.